This handy at-a-glance cheat sheet guides you through the steps checking and making accessible documents, whether you're checking an Acrobat PDF file or creating MS Word document. 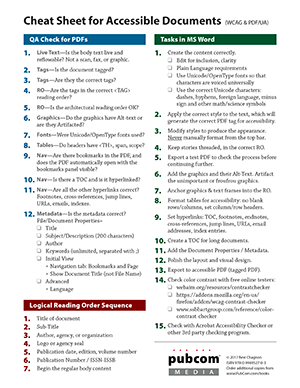 Handy one-page checklist format makes it easy to step through the process and ensure your documents are fully accessible to meet Sec. 508 and other regulations. Based on WCAG 2.0 and PDF/UA-1 international accessibility standards to ensure documents have the features needed for those using assistive technologies. Updated in 2017 for the latest versions of MS Word and Acrobat DC. License: 1 license for each user is required. This edition is only available as a digital download (accessible tagged PDF) with the ability to print it. Contact the publisher books@pubcom.com for bulk prices and institutional site licenses. This PDF is fully accessible for those using assistive technologies and showcases the methods detailed in the book. Order this cheat sheet through our online bookstore.